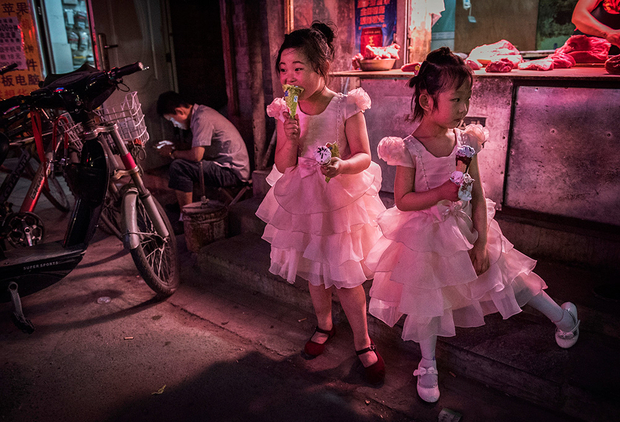 Girls dressed for a party eat ice cream as they stand in front of a butcher shop on a residential street in Beijing. This article was first published in Chinese by U.S.-China Dialogue. As of January 1, all married couples in China are now allowed to have a second child without penalty. When, in October, word spread that China’s government would end its longstanding one-child policy, Xiaoran Zhang posed the following questions to a group of Chinese reporters, scholars, and other observers who have spent time in the United States. She compiled the responses and posted them on the main social media account of U.S.-China Dialogue, a Chinese-language website that regularly convenes groups of commentators to discuss issues pertaining to China and the U.S. Within an hour, Zhang’s WeChat posts were viewed 3,000 times, before Chinese censors swooped in to block them. Even with the two-child policy is it really possible to raise a second child? Whether or not the two-child policy will face any actual problems will depend on people’s quality of life. What sort of lifestyle will they be able to have? Will parents who are just starting their careers feel secure enough to be open to the idea of raising two children? People often talk about the financial stress of raising a child, but I think peer pressure is another problem. Stable marriages also are an important factor. Rising divorce rates and lack of emotional support all matter as well. If people have low expectations for their marriages then this will, of course, affect people’s desire to have children. Enjoying a good quality of life means being able to take pleasure in a lifestyle filled with all kinds of different experiences. This is something that undoubtedly suffers when someone has another child. Our social welfare system will not be able to keep up and public services don’t seem up to the job. The majority of those of us born between 1975 and 1985 have been under so much pressure that we haven’t even thought about having children. For those of us who want children it is basically too late to take advantage of this new policy. If you add up the various costs associated with having a second child, you will realize that if you want a child, then what you really need the most is courage. The reason why I am raising this question is China’s large number of so-called “bear children” [particularly disobedient children prone to public displays of recklessness]. We hear shocking stories of misbehaving children over and over again, but if you look at each of these particular cases closely, you realize that this poor behavior really is inherited from the parents. And so, because of this, at least for a while, our society is paying attention to the consequences of the one-child policy. Many parents are subject to constant scrutiny and peer pressure and therefore tend to try to satisfy their child’s every need, which only aggravates the behavior of these “bear children.” If parents continue to raise their children this way, regardless of how many children they have, the problem won’t have been solved. Perhaps parents have to rethink their approach to parenting and find ways to bring order to this chaos. Why do we need to appease and encourage our children in this way? Does this happen because the parents themselves are constantly measuring themselves against others? Can parents learn to raise their children to be able to ask themselves, “Do I really want the things that other people have? Why do I want these things?” The question is whether parents can learn to guide their children to develop a sense of self-awareness and self-discipline. Is a two-child policy really the best way to deal with an aging population? Tian He, who earned her Ph.D. from Rockefeller University and is also a contributor to the Chinese social media outlet Stem Girls, a platform that discusses issues about women in science, thinks the implementation of a two-child policy and, even more so, the complete removal of family planning restrictions would be the most effective policies for dealing with an aging population. She believes that in the absence of a large-scale influx of immigrants to perform the labor needed to keep the economy growing, encouraging childbirth is the only way to address the issue of an aging population. “However, I do not think that the two-child policy will be able to reverse China’s course towards a graying society,” Tian says. One can see from fertility rates for each country published in the CIA’s World Factbook that all developed countries have a fertility rate below 2.1 children per women (2.1 is referred to as the replacement rate, the rate needed to keep a population size constant). However, Asian countries are at the very bottom in terms of fertility. This is probably due to the intense competition in Asian societies and the status of education in these cultures. Given these sobering statistics, the two-child policy will only have a small effect on the aging of the population. In 2013, when couples in which both parents were only children were allowed to have two children, people thought that there would be an explosion in new births. Government forecasts predicted that the annual number of births would increase to 2 million, which would have meant that in the two years since the implementation of the policy, there should have been 4 million births. The original plan was to maintain this policy for five years in order to allow for 10 million births overall. Now the policy is quickly being changed because the number of births has not increased significantly. The number of births over the past two years has not even reached 1 million. This suggests that even if restrictions on the number of children per family are completely lifted, a population imbalance in the future cannot be avoided. This policy is too late. Everything suggests that we need to remove restrictions. In fact, I expect that the policy will be abolished entirely. The Family Planning Commission is a big and complicated department, so it will take time for the policy to be phased out completely. An aging population will cause a lot of problems for China, but these problems will not be felt for another 50 years. So we still have some time. But in the end, population issues are different from other problems and are very hard to control. So, since many people have already commented on how difficult it will be to avoid an aging population, I will not go into it here again. The real question is: “What do we say to the older generation?” We need to increase social services and establish a pension system in order to safeguard against economic uncertainties. Raising the productivity of the working population is another way to address the issue. It is very hard to intervene in any way in order to prevent the aging of a population. Research has already proven this. Family planning has not been successful in rural China, where people regularly have more than the number of allowed children. On the flipside, the urban population has barely increased. Even if the restrictions were removed completely, it would be difficult to raise fertility rates. It is hard for government institutions to anticipate a sudden decline in population growth. For example, in East Germany between 1988 and 1994 the fertility rate plummeted to one child per woman. And even though Japan was one of the youngest developed countries in the 1980s, its rapidly aging society has practically made it one of the oldest today. The implementation of the two-child policy is simply a reaction to the same phenomenon, nothing more. It is possible that the policy will be phased out completely. Richard Jackson from the Global Aging Initiative says that China can reduce the gender imbalance of its population. Whether Jackson believes that this will help address the increased burden of caring for the elderly, is, personally, hard to say. But no matter which way we choose to deal with this, the effects of the winding down of the policy on the working population will not be felt for another 20 years. Will the two-child policy place put even more pressure on women? Even if the policy is abolished, decisions with regard to childbirth will still fall into the hands of the family, rather than the women themselves. A woman’s autonomy over her own body as well as the decision of whether to have a child or not are both still unrecognized and unprotected rights of women. Mandatory and unfair maternity leave rules, along with inequalities in terms of maternity care, all amount to women being treated as less valuable in the work place. Gender discrimination in the work place has been justified in the name of corporate efficiency. If we consider that women who are now between 25 and 35 years old and not yet had their first child are already suffering the most in terms of workplace gender discrimination, then this kind of treatment of women, I am afraid, will only be extended to include women who do have children in their late 30s. This policy will inevitably make the situation worse for women. Having raised the question as to whether the two-child policy would place an additional burden on women or not, this online piece sparked considerable debate amongst our commentators. The authorities will likely resort to moralizing and publically pressuring Chinese women. But the personal cost for women when entering marriage will be too high, so marriage rates will probably drop accordingly. Trying to pressure women into raising more children will likely backfire. The situation in Korea and Japan should serve as a lesson for the Chinese government. On one hand, you can focus on the greater oppression that women will be subjugated to, but, on the other hand, you should not ignore the fact that children can bring a great deal of joy to their mothers. This is especially true in the long run. The one-child policy significantly limited the reproductive freedom of women and forced many of them into choosing an abortion. How can we not oppose this kind of oppression? The two-child policy, of course, is just another form of oppression. Basically, it is not very different from the one-child policy. That is why we need to return to “basic human rights” as a framework for thinking about this problem and confer reproductive rights onto the families. Should reproductive rights be assigned exclusively to women or include the “family” as well? Because the womb is inside the woman’s body, reproductive rights can only belong to women. Reproductive rights involve reproductive freedom but also include the right to refuse to have a child. The aging of the population is a trend that certainly requires a response. Perhaps technological developments will be able to reduce the need for a large labor force and thus a shrinking workforce will be less of a concern. But the most important thing is that we do not rely on the constraining of women’s reproductive choices as a means to solving this problem. Do you support the two-child policy? When we asked whether our commentators supported the two-child policy, everyone seemed to agree—a first in this forum’s history. If you want to systematically reduce costs for parents you can increase the number of public kindergartens, increase investments in public education, offer assistance to women who often pay a price in terms of personal career ambitions when they have children, urge companies to adopt more flexible work hours, and encourage fathers to participate in the rearing of their children, etc. The main reason for this should be to make up for the serious human costs incurred as a result of the previous family planning policies. However, in reality this new policy is aimed only at dealing with an aging population. Li agreed and pointed to an article he published on the Tencent online magazine Dajia in 2014, in which he had discussed the need to abolish the one-child policy. In my opinion, if the goal is to protect human beings, then a justification based on “rights” is more legitimate than a utilitarian argument. But it will be difficult to make that sort of justification. Having thought about this issue over and over again, I think that, instead, we should be happy that at least this time many people have engaged in the debate, even if it is only one revolving around utilitarian arguments. For example, Amartya Sen, winner of the Nobel Prize in Economics, discussing population issues in India, denounced India’s gender discrimination, which has resulted in “one million lost girls.” Where should we take this argument, then? The preference for boys over girls is also a manifestation of reproductive choice. Economists have already shown that, from a utilitarian perspective, abolishing family planning policies altogether is not at all an issue. In fact, the removal of all restrictions would help make the case that reproductive rights should be conferred onto “the family.” For the government or social organization to make reproductive decisions on behalf of the family is not only economically inefficient but will also cause people to fall to a level of materialism, become enslaved, and lose all human dignity. In fact, it is because of this last point that the two-child policy is the wrong policy. Translated by Michael Laha and Zhang Xiaoran. U.S.-China Dialogue is a Chinese-language website published by the Center on U.S.-China Relations at Asia Society, which also publishes ChinaFile.